A columnar tree with fiery red fall color. The growth habit is similar to 'Bowhall'. 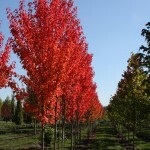 This U.S. National Arboretum release is probably one of the cold hardiest red maples. It is easily grown in average soil in full sun to part shade. It prefers moist, acidic soils with good drainage. Selected from a Minnesota seed source. This is a seedless tree.